Make malunggay water by boiling 7 cups of water with malunggay leaves with stalk. Simmer in low heat for 10 minutes and set aside. 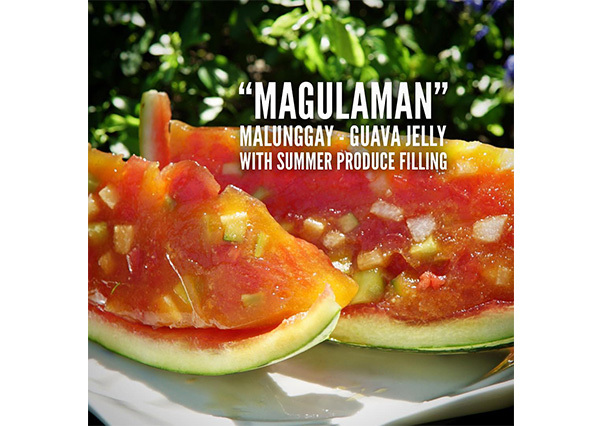 Make sure to remove / strain the leaves.Add guava puree and powdered gulaman. Keep stirring. Add in diced watermelon, diced cucumber and diced singkamas. Before it cools down, you may add some honey. Let it set in the watermelon shell and refrigerate for about an hour until it sets. Cover with cling wrap.